Sterling Silver Designer Studs and Plain Stud Earrings without Stones. 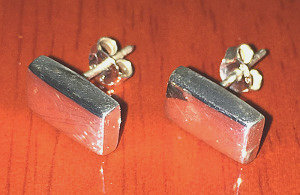 Sterling Silver Bar drop stud Earrings with Gold finish ends. Designer long bar shaped Gold and Silver combination jewellery Earrings. Tubular Gold and Sterling Silver combined stud drop earrings. Silver 925 earrings finished with Gold ends, long drop 15mm contemporary earrings. Real polished Wood rectangular Sterling Silver earring studs. Designer Wood inlaid in Sterling Silver pair of contemporary earrings. Sterling Silver ear Studs inlaid with maze paved barrel design polished genuine Wood setting. Designer genuine Organic Wood used in conjunction with Sterling Silver for a unique jewellery ear studs organic creation. 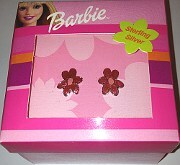 Barbie Earring Studs in Pink Flower enamel design. Boxed in Barbie branded packaging. Sterling Silver earring studs with tri-colour detail (pair). 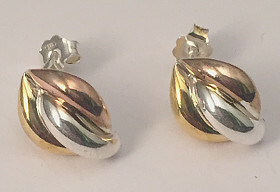 Yellow Gold and Rose Gold finish on Silver ear studs with scroll backs, approx. 16mm size. 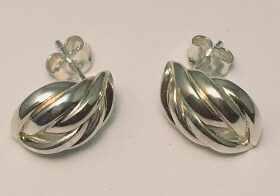 Sterling Silver Knot design stud earrings with scroll backs (pair) approx. 16mm size. Sterling Silver polished finish large Bar Ear Studs (pair). 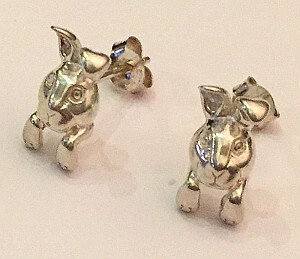 Sterling Silver Bunny Rabbit head and paws design Earring Studs. Approximate size 13mm ear studs including scroll backs. Cute Bunny face with floppy ears and front paws.